When it comes to popping “the question”, a classic diamond engagement ring is a go-to pick for that symbol that she’ll treasure for a lifetime. However, a significant other with a unique sense of flair wants to say an enthusiastic “yes!” to a ring that’s unusual. Here are some out-of-the-box engagement rings that could serve as the ultimate surprise for that special someone in your life! The question is: would you or your significant other wear these unusual engagement rings? 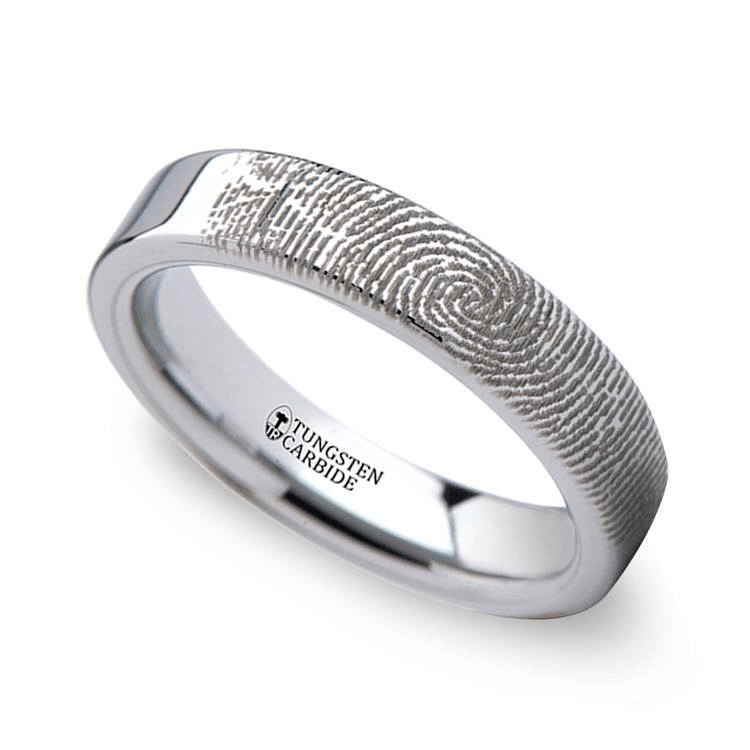 Instead of putting a big rock on her finger, why not keep your fingerprint with her? Your fingerprint is completely unique to you, made up of a particular pattern of swirls and lines that can only be traced back to your DNA. A ring that showcases the individual fingerprint of the one you’ve vowed to walk hand-in-hand with is so personal that it’ll be treasured forever. And it’s special enough to stand out from the crowd! The thought of an engagement ring usually conjures the image of a colorless sparkly diamond, but things aren’t always so clear cut. 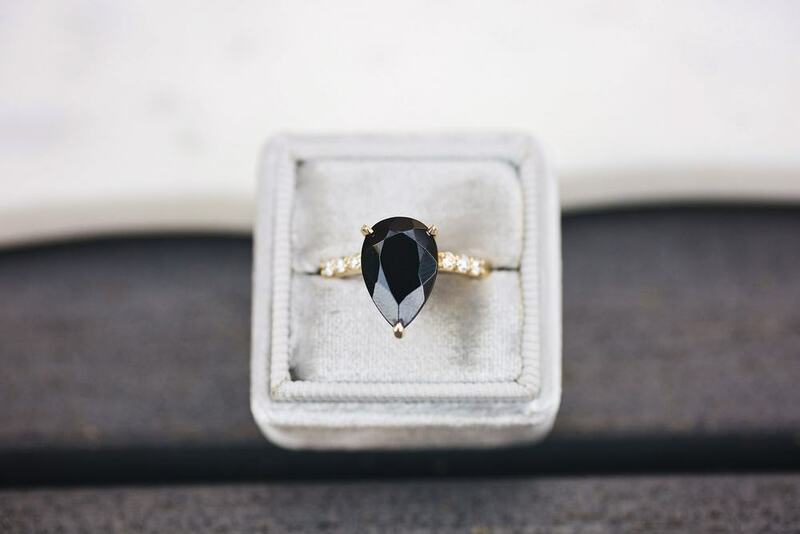 A ring with an, instead, black diamond stone is a unique way to propose. 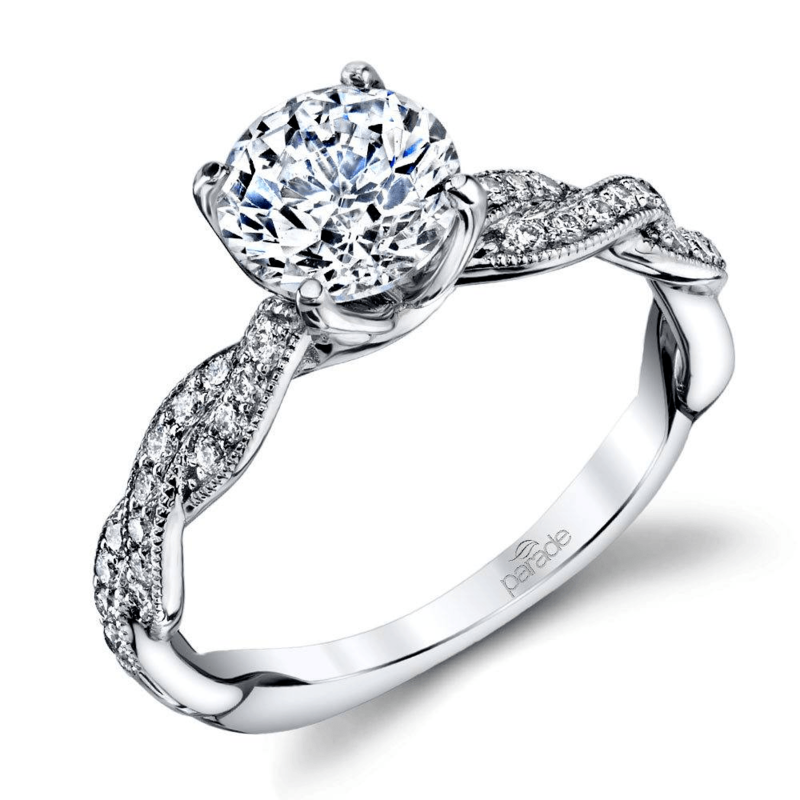 Paired with a white gold band and platinum prongs, a dark center stone is a bold way to make a statement, perfect for a fiance with flair and her own special sense of style. A ring that really puts its own twist on a classic is this luxurious and gorgeous ring from the Parade line, featuring not only a center stone but a band that is semi-covered with diamonds, twisted into an intricate pattern for a detailed look that any bride-to-be would love. This is a unique look that proves to be totally glamorous and envy-worthy! Choosing between yellow gold, white gold, or rose gold is always a tough debate. But who says you can’t have it all? 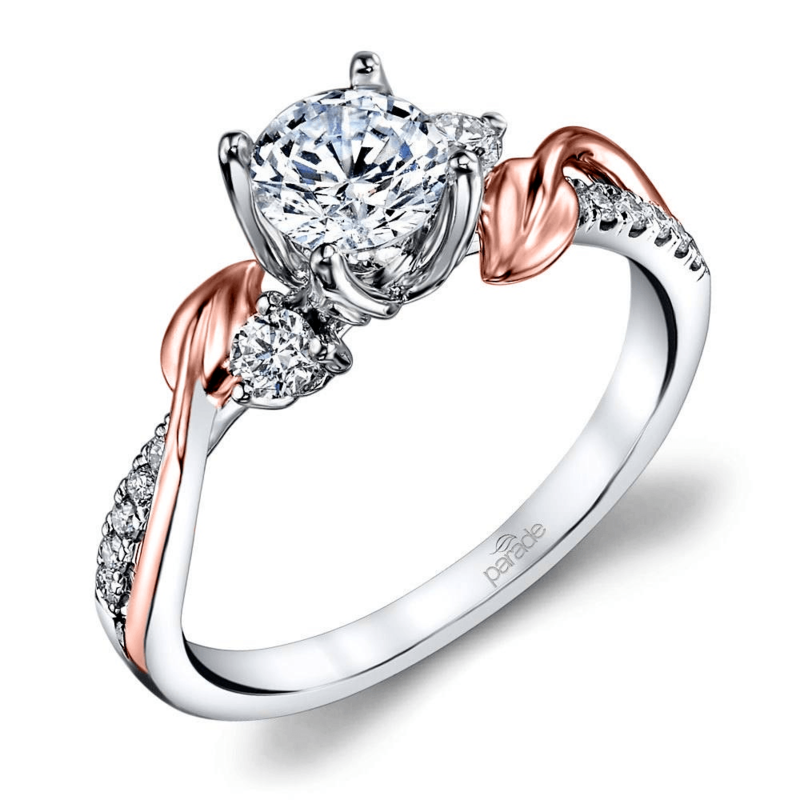 This out-of-the-box engagement ring permits the perfect mix of rose and white gold, depicting delicate rose-colored leaves to accent the beautifully featured stones. A splash of color is always appreciated, and this style is a great way to jazz up an otherwise classic ring. We love the playful contrast and nature-inspired design of this nontraditional engagement ring! For a lady who loves the sea, a ring with a nautical twist is perfectly suited. 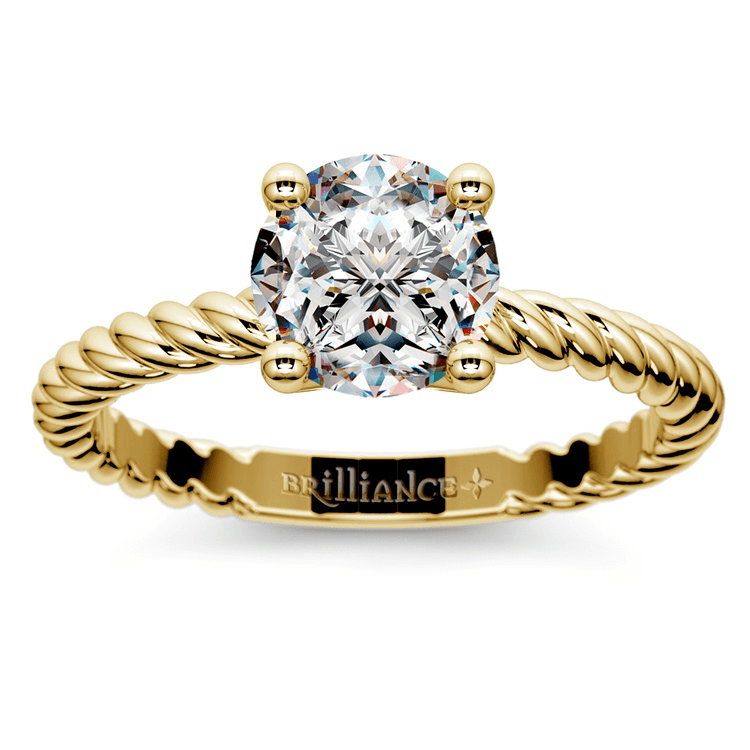 This ring features a twisted rope band with a classic center stone, giving it enough flair to set it apart. Whether it’s gifted to a beach dweller, sailor, or lover of all things boating, this is a great way to incorporate a love of the sea into a ring that will be treasured forever. And this one doesn’t skimp on the bling! From a personalized fingerprint ring to something that provides a modern twist on a classic style, these rings are all special in their own unique way. Even if your style is more aligned with a classic engagement ring, it’s easy to appreciate the creativity that these pieces signify in the world of wedding jewelry!